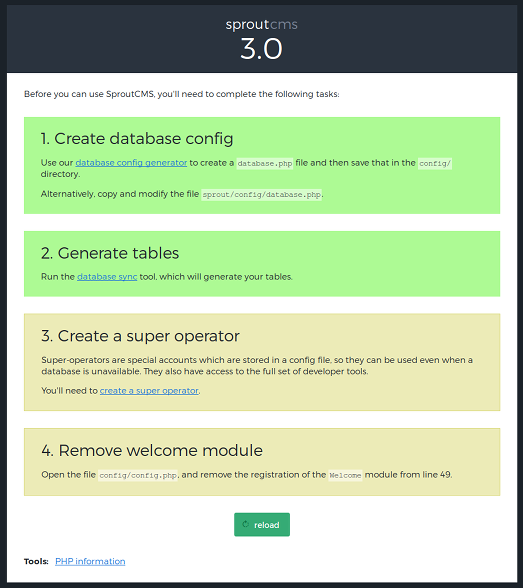 The welcome module provides a checklist of a few tasks to complete in order to configure SproutCMS for initial use. For example, making sure it can connect to the database, and setting up the initial operator account. The steps simply need to be taken in order until they're all the happy bright green colour. Once they have been comnpleted, clicking the 'reload' button at the bottom will send you to the home page of your new SproutCMS site.